New Delhi, February 9: "Any Prime Minister of the country will certainly monitor the progress the activities, not just purchases of defence or any other schemes like Ayushman Bharat or many more." said Nirmala Sitharaman. In her reply in LokSabha on January 4th she made it clear that there are talks among the opposition and questions have been raised about Prime Minister’s Office interference. “if the Prime Minister’s office pursues a matter, what is progress? How far it is happening? Is it happening in France? 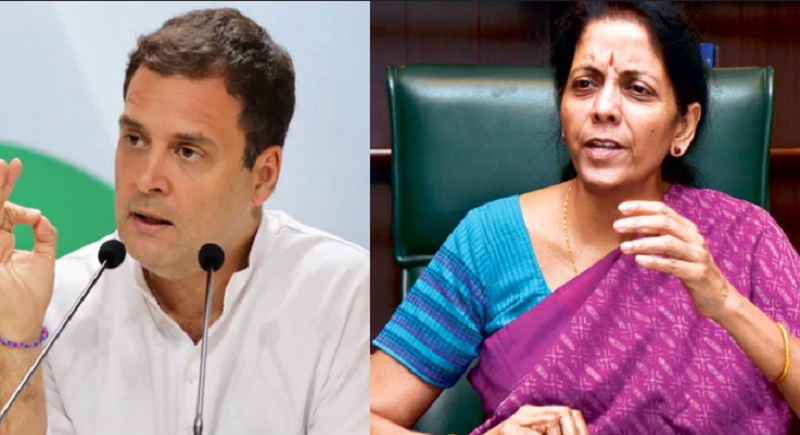 Such things cannot be interference at all.” Defence Minister Nirmala Sitharaman made it clear to media after Rahul Gandhi’s Press Conference yesterday. Further slamming the opposition she alleged that the then Chairperson of the National Advisory Council Sonia Gandhi used to run the PMO regularly during the UPA regime. "Was that not interference?" she asked. "They are flogging a dead horse. Periodical enquiries by the PMO cannot be construed as the interference," the minister said during the Zero Hour. The Defence Minister charged the opposition with playing into the hands of multinational companies and vested interests and not working in the interests of the Indian Air Force. Referring to the report, which claimed that the then Defence Secretary had objected to the PMO allegedly conducting price negotiations with the French company. Rahul Gandhi made it clear that when he went to meet Manohar Parrikar he did not discuss anything about the Rafale case. Rahul Gandhi alleged that the Prime minister is directly involved in the Rafale scam. By referring The Hindu Newspaper he said the Prime Minister is carrying out the parallel negotiation with French. He stressed that is about the future of every youth and person from Armed forces who fought and die for us. But Prime Minister has stolen this money, bypassed a process and give this money to Anil Ambani. He further said, The ministry itself said that it is, therefore, clear parallel discussion with PMO has weakened the negotiating position of MOD and Indian negotiating team. Any officers who are not part of the Indian negotiating team may refrain from having parallel parleys with the officers of the French government In case the PMO is not confident about the outcome of the negotiations being carried out by Ministry of Defence a revised modalities of negotiations to be laid by the PMO at the appropriate level may be adopted in the case. Rahul Gandhi stressed on his allegation by saying that the Defence Ministry itself is saying that the Prime Minister is conducting parallel negotiation. He again said that Mr Holland has said that Narendra Modi came to me and said this contract should be given to Anil Ambani and not to HAL. Friends in the Air Force, Generals, Pilots should know that PM has stolen 30,000 crores of rupees and given to Anil Ambani. This 30,000 could have been used for your safety, could have been given to your family this money can be given to you when you die in a plane crash. Defence Secretary of India by saying that it is desirable that such discussions be avoided by PMO as it damages our negotiating position seriously.